Are you feeling guilty about all those “wasted” hours on Facebook? Do you scroll through your news feed with a sense of irresponsibility as the work piles up in your inbox? Well, now you don’t have to. Check out this video explaining how Facebook and Donate Life are saving lives. Just click on the image to start the video. 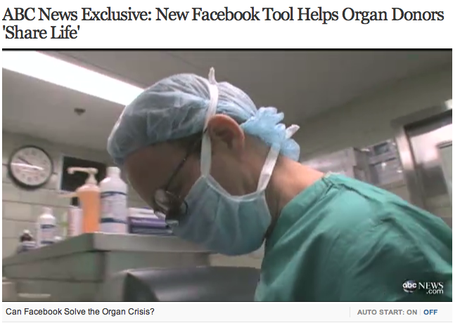 Facebook has partnered with Donate Life America and recently announced the new “organ donor” status tool. Now, you can declare your live-giving choice to your friends. The first step in organ donation is making the choice. The second step is letting your loved ones know your wishes. Every day 18 people die waiting for a organ donor. You can save 8 lives and improve many more by becoming an organ donor. No one wants to think about their own death. I don’t. But I signed up to be an organ donor when I was sixteen years old and I have the little heart on my driver’s license to prove it. I never expected that my husband would need a liver transplant some day. When the time came, the wait list was too long. John would have died before he got a liver. Instead, a heroic member of our family donated half of his liver to John and saved his life. Luckily his anatomy matched closely enough for a successful living donor transplant. Not everyone is so fortunate. Go to Timeline, click on “Life Event,” select “Health and Wellness,” choose “Organ Donor.” And make sure to click on the “Officially Register” link to make your decision to be a donor official by registering in your state. It’s that easy! Please share this post with everyone you know.